The endearingly scruffy Norfolk Terrier is lapdog-sized but bold and big-hearted: along with its blood brother the Norwich Terrier, it’s the most diminutive of the working terriers, but nonetheless fully embodies that group’s strength and pep. Norfolks are covered pets in the USA but also relatively rare: It’s not the simplest or quickest process to acquire one usually, but owners captivated by these “toy” terriers are willing to wait. The Norfolk and Norwich terriers claim intertwined origin stories, both of them hailing from England’s East Anglia region (home to the county Norfolk and the town of Norwich). In the mid-20th century, the Norfolk was being called the Norwich with “drop ears”: The Norfolk’s folded ears are the prime visual difference from the pricked-ear Norwich. In 1979, Norfolk Terrier became the official honorific of the drop-eared variety. Names aside, the American Kennel Club notes that interbreeding of Norfolk and Norwich terriers has been negligible since the Second World War. The low-slung and pocketsize form of the Norfolk (and Norwich) Terrier developed from East Anglian breeding as ratter. These little terriers were also cultivated for pack-hunting, as they were used to “bolt” foxes and other larger quarry. This heritage lives on in the Norfolk’s comparatively sociable nature toward other dogs. The Norfolk Terrier stands less than a foot tall at the withers and weigh a mere 10 to 12 pounds. It appears big-headed and stretched-out. The furry face framed by those dropped ears draws the eye; the legs are short and the tail upcurled. The coat has a rough, rustic sort of look. The “classic” Norfolk color might be considered red, but the terriers also come in wheaten, grizzled, and black-and-tan suits. Those coats are double-layered, the topcoat coarse and wiry and the undercoat softer and tighter. The Norfolk Terrier has a self-assuredness out of proportion to its physical dimensions; “fearless” is a common adjective applied to this born-and-bred ratter and hunter. It’s also a loving and personable dog, relishing human contact and typically great with kids. As we’ve already mentioned, the Norfolk’s pack-hunting past means the terrier – as long as it’s been adequately socialized – can get along very well with other dogs (and, usually, house-cat roommates). But its equally ingrained predatory impulse makes it iffy to integrate into a household with smaller pets such as ferrets or rabbits. Norfolk Terriers will bark at unfamiliar folks or situations on occasion–they’re decent watchdogs–but by small-dog standards they aren’t especially yappy. The Norfolk is happy from countryside to city, as long as its needs for exercise (and plenty of human contact) are met. Its size and demeanor also make it quite a good traveler. The Norfolk’s hard coat doesn’t shed very much at all. It should be brushed weekly and hand-stripped (which removes loose hairs) at least a couple of times a year; this is a job that can be done yourself, or entrusted to a professional groomer. Norfolk Terriers commonly live into their mid-teens, some longer. The relatively few major health concerns include patellar luxation – the dislocated-kneecap condition widespread among smaller dog varieties – and hip dysplasia, as well as mitral valve disease. Under-exercised and/or overfed Norfolks can certainly develop obesity, so make sure yours is getting plenty of walks and games of fetch, and closely monitor its food consumption. To repeat, the Norfolk Terrier resembles a toy breed in its small size, but it’s a working dog, and it needs daily exercise. Leashed walks, rousing play sessions with other dogs, and fetch inside or outdoors in an enclosed yard all fit the bill. 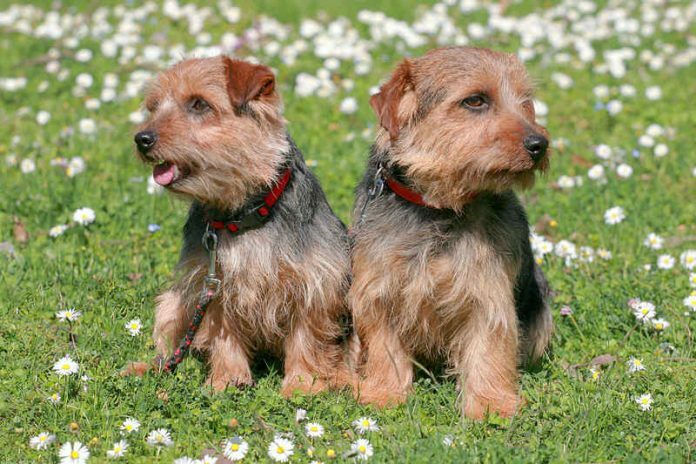 Norfolk Terriers are intelligent dogs, game for the challenge of learning commands and trucks. They’re also strong-willed and frequently stubborn: they may actively explore just what they can get away with, and resist obeying you if they’re feeling bored (or just plain naughty). Stick to a consistent training regimen and positive reinforcement, and you’ve got a great chance of developing a well-behaved, talented, and sociable Norfolk companion.